An increasing volume of black slate from Spain has been finding its way into historical projects as a substitute for increasingly scarce and expensive black and gray-black slates from traditional domestic slate regions. Although these Spanish quarries have been operating since the Roman occupation, exports to America are without much historical precedent and their use is a compromise between budget and authenticity. Regardless, this handsome, uniform slate is easily worked and rated as very durable. Here we see the slate applied over a rambling Queen Anne style porch, an approximate match for the aging Monson black slate on the main roof. When the main roof itself becomes due in the next few years, it too will be replaced by the black Spanish slate. If the spec says “as existing”, or something to that effect, you have choices to make when buying material that can affect client satisfaction and your bottom line. With your purchase, you are committing yourself to one or another repair strategies, each with its own risks and benefits. Choose carefully, because you may be held accountable if issues develop, no matter what the specification said. To help uncover the pitfalls, we have enlisted the counsel of Mickey Miller, Sales and Technical Consultant for the Roof Tile and Slate Company. The Roof Tile and Slate Company maintains one of the largest inventories of salvaged slate and tile imaginable in Carrollton, Texas. They also deal in new goods from reputable quarries and tile producers worldwide. The main reason that there is no one simple answer is that these durable materials remain in service while the companies that produced them have mostly gone the way of the dinosaur. Unlike the dinosaurs, there is no mystery to what happened to most of the hundreds of quarries and tile plants that once dominated the roofing market. Beginning in the 1920’s they lost sales to low cost roofing materials such as the ancestor of today’s asphalt strip shingle. Consumers embraced the upfront savings these materials offered, even though they paid out much more in multiple replacements over time. By 1990 the market share for slate and tile together had declined to 4%. Over the last decade, however, someone must have begun doing the math on roofing costs because slate and tile has bounced back to a respectable 14%. This sudden recovery has sparked wider interest in the form of foreign imports, renewed domestic production and an increase in salvage activity. These expanding options and new players offer many benefits that you should be aware of and present a few problems too. Buying salvaged historic slate and tile presents a particular set of risks and benefits. The most compelling advantage enjoyed by well matched seasoned material is its ability to vanish into the field in a way that bright new work never can. It will always be the first choice for preservation work. Salvaged goods also have cost and scheduling advantages. They are usually cheaper and immediately available whereas backorders for new slate and tile are usually measured in months, not weeks. The main risk with salvage, of course, is condition. It is well to confirm that there is at least as much service remaining in the replacement material as in the existing roof. Punky delaminated slate or cracked antique tile isn’t just used, it’s used up. There is a belief out there, often among people with salvage to sell, that these historic materials can perform forever. Mickey Miller suggests that buyers make sure that they understand what sellers consider “useable” material as that may include considerable hip or valley pieces and fragments that may not serve their application. Even if you are getting whole pieces, expect more handling breakage than with new goods. A hands on inspection is your best defense against surprises. If this is not possible, you will be relying on the reputation of the vendor. Salvaged roofing slate is in circulation from every historical roofing slate bed which has ever been worked for the American market in an approximate Appalachian arc from Georgia to Newfoundland, plus Wales. If you need it, someone else probably has it, if they know what exactly it is. Mythmaking and the passage of time can obscure the true origins of this durable material so make sure that you know what you have. If in doubt, the only absolutely reliable way to know for sure is by laying a sample into the field. Even the experts can be fooled so be careful about casual identifications, no matter how emphatic. Brand new slate is still available from virtually all of these same slate beds, for a price. The price ranges from the totally prohibitive to not that much over the cost of salvaged material. The characteristics of these traditional slates are well understood and as long as they are coming from a reputable quarry, they can be purchased with confidence. Depending on the age and weathering of the existing roof, new quarried slate can often blend enough to serve adequately as replacements in the field. 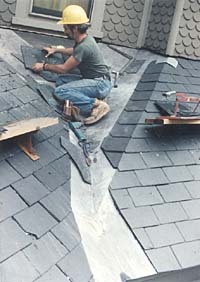 Imported slate is another matter as some foreign producers are offering material that is neither dense enough nor consistent enough to perform roofing service. That said, there are reliable imported products that have found a niche as a substitute for expensive or unavailable traditional domestic products and are well worth looking at in certain cases. It would seem that as a manufactured product, it would be easier to match roof tile than slate. Tile is tile, right? Unfortunately, according to Mickey Miller, it is not. Like slate, tile clay is a natural masonry material whose appearance is peculiar to the location in which it was dug, but unlike slate, the character of tile is decided in the manufacturing process. High durability is achieved by a finer screening of the clay and higher firing temperatures all of which serve to create a fully fused, non-porous, longer lasting material. This is most critical in any environment exposed to cycles of freezing and thawing. Consistent adherence to high standards over the years has earned the Ludowici brand recognition as the U.S. standard and thus the model for imitation going back many decades. Salvaged Ludowici therefore demands a higher price than salvaged off brands and even most new imports. Expensive or not, Roof Tile and Slate tries to maintain around 1,000 squares of salvaged Ludowici in their yard but it seems to go out the gate as fast as it comes in. With such a well recognized industry standard, there seems reason to hope that copycat salvaged roof tile would be interchangeable. Not necessarily. Ludowici will rarely lock up with tile of its many defunct imitators. To further complicate the matter, tile from any one of the many plants Ludowici formerly operated won’t necessarily fit tile from any other and will certainly not fit the tile which they are manufacturing today which is 3/8″ smaller overall. As a result, the buyer must be particular when seeking units for “patches”, but can consider a wider range of options when replacing entire roof planes where compatibility to existing tile isn’t relevant. There are clients who are unprepared to compromise any degree of authenticity for budget. They are determined to have a certain historical material regardless of cost and availability. No one likes to say no to such projects and it isn’t always necessary. Roof Tile and Slate recently served such a client through the production of a roof copied from a single antique Turkish tile. The work was done by a custom terra cotta studio and cost over $4,000 per square. Similarly, there are traditional slate regions where roofing slate is no longer commercially produced but where quarries can be found who are willing to take custom orders, for a price. Mickey Miller has heard persistent rumors about divers who have found a Georgia quarry site at the bottom of a lake, a 1930’s flood control project, with slate stacked and palletized, ready for shipment. If they can talk about lifting the Titanic, that slate just may be available for the right Georgia project. This entry was posted in Roof Restoration and tagged Roofing Slate and Tile, Texas. Bookmark the permalink.